"The whole world is watching", which reproduces the text of the tweet accompanying this image, is a classic anatheme of activism. Coined by Don Rose, "press officer" of peace groups protesting against Vietnam War around the Democratic National Convention in Chicago in 1968, the sentence claimed transparency as the best weapon against police repression and impunity. 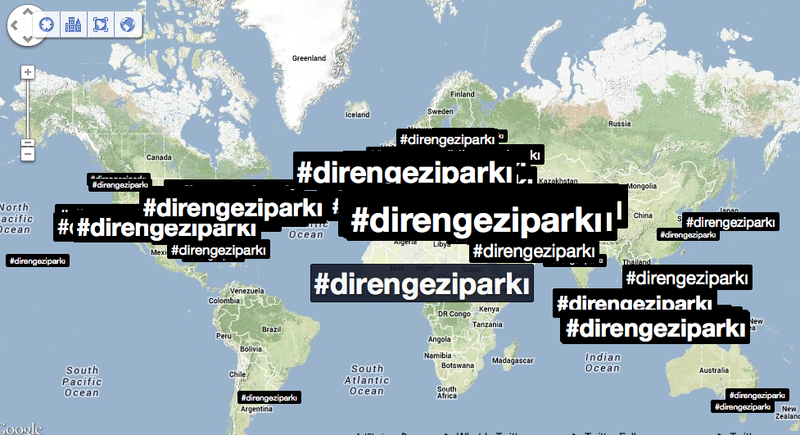 This happened on May 31st when the hashtag #DirenGezi (“Resist, Gezi”) was a Global Trending Topic, making visible international solidarity with Turkey and, at the same time, the autonomy of crowds to create broadcast networks with global reach, regardless of the media. Only that day the number of tweets with this hashtag reached 950,000, which evolved as the protests progressed, mutating into others like #Occupygezi #capulcu #Occupyturkey #tayyipistifa, #direnAnkara or #duranduran.